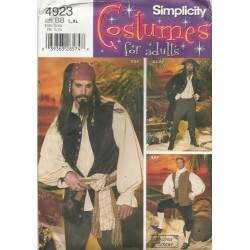 Men's pirate costume and colonial style sewing pattern. No. 4923, Simplicity. 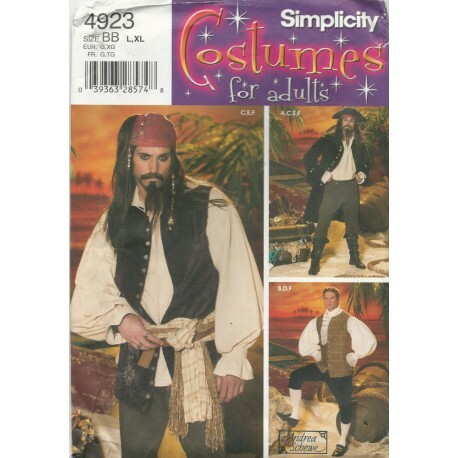 Includes the coat, lined vest, shirt, cravat and pants. Not only could you sew a fun pirate costume with this pattern, but you could also sew a men's colonial outfit for re-enactment with it. Designed by Andrea Schewe. A nice sewing pattern from Simplicity! Size: Men's L, XL. See photo for measurements. Condition: Unused and uncut. Still in factory folds. Some wear and light tearing of the envelope.